Diane and I decided to do some hill training on Sunday while returning from “Trail of Tears”. We started a bit late though but we were glad we could make it. Reached Percy Warner Park at around 3:35. Kim joined us too. We started from the stone gate entrance at around 4:00PM. 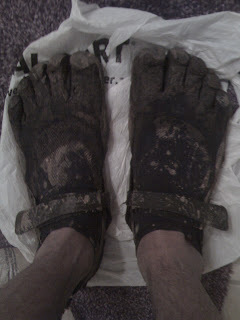 I was excited about putting my VFF to test in the mud and stream. Took our water bottles and we headed towards the hills. I have very good memories here. My first US marathon, Flying Monkey Marathon, was in this park. You’ll call yourself a monkey and people will call you ‘Monkey’, if you complete this marathon and yet you will not get offended but feel proud. “He is a monkey too”, Diane told Kim, and she was telling about the mail I sent to the message board saying “Can anyone give a ride to an Indian monkey”. Good times. 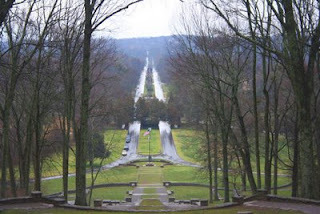 Here we are once again running in Percy Warner Park, but just that we’ll be running on dirt and hills. After about a mile in the run, we encountered some serious dirt and mud. My VFF offered some good grip though. KSO – Keeping Stuff Out, stood up to the test though. It didn’t offer any waterproof but it did keep stuff out. Size 48 on mud was making foot prints like that of a ‘Big foot’. Several steep climbs, tiny waterfalls, serious dirt, roots, it was one good hill training. We were running at conversation pace discussing about our upcoming races and then Diane and Kim had their Gossip time. Then the conversation switched back to running and food. It was fun! We completed the white trail and then the Red trail loop. My leg was looking so dirty, but again my VFF offered very good grip especially while running down hill. My legs and thighs were completely covered with mud. One helluva trail running. We completed the whole course in about an hour and fifty minutes covering a distance about 7 miles. We then went for short walk to warm up a bit before heading home. 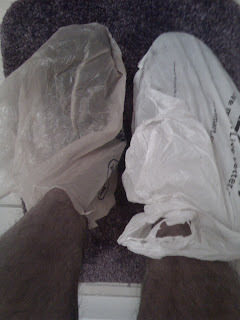 My Vibram’s were so dirty that I wore a plastic bag on top of them. I didn’t want Diane’s car to get dirty. It looked pretty funny though. I was walking with my Vibram’s wearing those plastic bags and my neighbors gave me weird looks. Glad I wore them, my carpet is safe too. Cleaning them was no big deal. Just stand under the shower with those shoes and the dirt just got washed away. Sweet. Thanks Diane, John, Kim and Keith. You made my weekend.